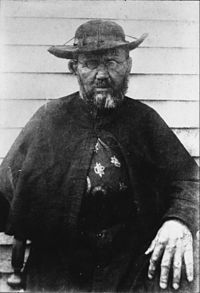 English: Father Damien (born Jozef De Veuster on 3 January 1840 in Tremelo, Belgium, and dead on 15 April 1899 in Molokai, Hawaii) was a Belgian catholic priest and missionary in Hawaii. He was member of the Congregation of the Sacred Heart of Jesus and Mary. Français: Le Père Damien (né Jozef De Veuster le 3 janvier 1840 à Tremelo en Belgique, et mort le 15 avril 1889 à Molokai, Hawaï) est un missionnaire belge, membre de la Congrégation des Sacrés-Cœurs de Jésus et de Marie. Italiano: Damiano de Veuster, anche noto come Padre Damiano, nato Jozef De Veuster (Tremelo, Belgio, 3 gennaio 1840 - Molokai, Hawaii, 15 aprile 1899), fu un sacerdote cattolico e missionario belga che svolse il suo ufficio nelle isole Hawaii. Morì a causa della lebbra e fu proclamato santo dalla Chiesa Cattolica. Media in category "Father Damien"
This page was last edited on 25 May 2018, at 05:01.